The perfect kit for double sleeving your decks! 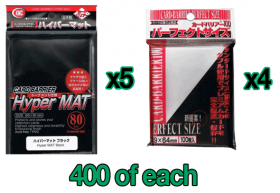 Five 80-packs of KMC Hyper Mat sleeves and four 100-packs of KMC Perfect Size sleeves for a total of 400 of each. That's good for double-sleeving 6 standard 60-card decks with some leftover for your sideboard, or 4 EDH/Commander decks! KMC Hyper Mat (Matte) card sleeves have an extremely matte back, are extremely low gloss, and are perfect for tournament use. They are produced to the highest quality to reduce gloss and increase strength. They are considered to be the least slick sleeves on the market; making them the easiest sleeves to shuffle and keep stacked. They are .12mm thick and are 66mm x 91mm. KMC Perfect Size card sleeves are perfect for double-sleeving your cards! They are ultra clear and fit tightly around your cards allowing them to also be placed into a regular card sleeve for extra protection. They are .10mm thick and 64mm x 89mm. Standard size sleeves fit cards from trading card games such as Magic: The Gathering, Pokemon, Race for The Galaxy, Thunderstone, Pandemic, World of Warcraft TCG, Chaotic, Naruto, Lord of the Rings, and more! Best thing since sliced bread. I doublesleeve all my decks. Heck I had extras and I single sleeve my draft decks.